It came out very tasty. The chili black bean sauce was quite spicy. The only tricky part was cutting the nori. Make sure your knife and cutting board are very dry. 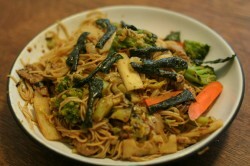 This entry was posted in cooking and tagged asian, noodles, stif-fry. Bookmark the permalink. Strange this submit is totaly unrelated to what I was looking google for, however it was listed around the 1st page. I guess your doing some thing right if Google likes you enough to place you on the 1st page of a non associated search.